Equipping large trucks with advanced safety technologies has the potential to prevent up to 63,000 truck-related crashes each year, according to new research from the AAA Foundation for Traffic Safety. In 2015, large trucks were involved in more than 400,000 crashes that resulted in more than 4,000 deaths and 116,000 injuries -- a four percent increase from 2014. 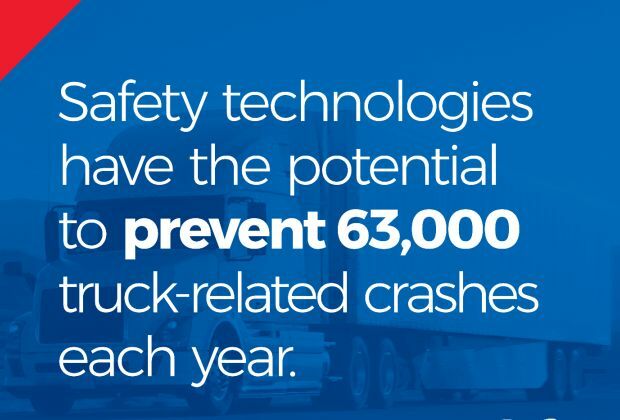 AAA recommends that all large trucks, both existing and new, get equipped with cost-effective technologies that improve safety for everyone on the road. About AAA Foundation for Traffic Safety: Established in 1947 by AAA, the AAA Foundation for Traffic Safety is a not-for-profit, publicly funded, 501(c)(3) charitable research and educational organization. The AAA Foundation’s mission is to prevent traffic deaths and injuries by conducting research into their causes and by educating the public about strategies to prevent crashes and reduce injuries when they do occur. This research is used to develop educational materials for drivers, pedestrians, bicyclists and other road users. Visit www.AAAFoundation.org. AAA clubs can be visited on the Internet at AAA.com.